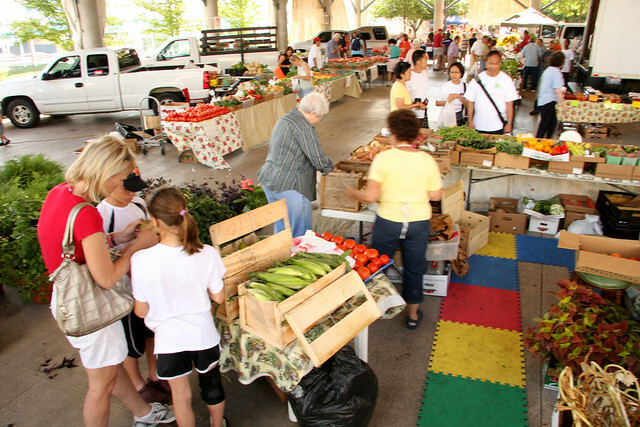 LITTLE ROCK — Tom Vilsack, U.S. Secretary of Agriculture, has declared August 2-8, 2015, "National Farmers Market Week." This year marks the 16th annual celebration that honors the important role farmers’ markets play in local economies. There are more than 8,200 farmers’ markets in the United States, a 76 percent increase since 2008. The numbers continue to rise, along with their collective impact on communities across America. Arkansas is among the top 10 states with the sharpest increase in farmers’ markets, and is one of five states included in the U.S. Department of Agriculture’s StrikeForce for Rural Growth and Opportunity, a program that has increased investment in rural communities through intensive outreach and stronger partnerships. The University of Arkansas System Division of Agriculture estimates that approximately 100 markets are operating across the state. “This summer, I’ve traveled the state and provided support to at least 10 small rural communities, all wanting assistance in forming new markets,” said Beverly Dunaway, an extension Arkansas MarketMaker representative for the University of Arkansas System Division of Agriculture. Evidence is also growing that farmers’ markets are becoming effective at increasing food access to underserved populations around the country. Supplemental Nutrition Assistance Program, known as SNAP, sales at Arkansas farmers’ markets have increased 300 percent since April 2014. Michele Rodgers, Arkansas Department of Human Services SNAP Outreach Manager, said her office had approximately 60 farmers and farmers’ markets registered to participate in SNAP. “We would like to see all Arkansas farmers’ markets have the ability to accept SNAP and other food incentive programs,” Rodgers said. She said her office was partnering with other agencies to apply for a Food Insecurity Nutrition Incentive grant to fund SNAP ‘Double Dollars’ programs for participating markets. “This program will assist in making fresh, local food even more affordable,” she said. Some Arkansas markets have become significant contributors to institutions wanting local food, such as The Fayetteville Farmers’ Market CO-OP, established in 2014. Teresa Maurer, Fayetteville Farmers’ Market vendor coordinator, said co-op used information gleaned from volunteers at previous markets to identify what produce items remained unsold most often. Trudy Redus, President of the Arkansas Farmers’ Market Association, said the association sought to provide valuable resources and networking opportunities for market managers to support markets and farmers throughout the state in any way it could. “We believe one way for farmers markets to grow and sustain themselves is through the work of market managers,” Redus said. As part of a contest to promote farmers markets, AFMA is inviting its members to participate in National Farmers’ Market Week by submitting summaries of their planned activities prior to August 2 and pictures of actual events by August 10. An independent panel will judge entries according to their impact. The market with the winning entry will receive a $250 cash prize. Second- and third-place entries will receive $100 and $75, respectively. To learn more about the contest, contact Beverly Dunaway at bdunaway@uaex.edu or call 501-650-0981. For more information about how Arkansas MarketMaker can work with your farmers market, visit http://www.uaex.edu/farm-ranch/economics-marketing/market-maker/.